rodndtube.com's (OLD) MyPaipoBoards Forums. Reading but no posting on the OLD forums. :: View topic - Surfing on Air ? Posted: Mon Mar 29, 2010 8:29 pm Post subject: Surfing on Air ? We've all tried different materials and designs in attempts to reduce wetted surface area or to enhance performance but is it possible to surf on air ? Kind of like a surfmat but without the bottom skin, the benefits of an Air Board would be that the bouyancy can be altered to suit the wave or rider, it would also have minimal foam and possibly a multi piece board that fits in a backpack. Because it rides on air it would conform to the optimal shape of the wave and have low friction. I know there are 'air-lubricated' boards that are a bit like this but they dont have all these benefits in one board. 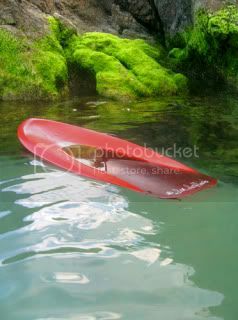 The closest I can find to illustrate is this board, but imagine its upside down and only the rails contact the water. It might not be possible but its worth asking if anyones thought of it ..? If not a clear skin of air maybe a foamy layer ?? I wonder how much has been done with dual tank air mats...two air intake valves, two chambers. Make it so you could quickly dump the air from the mid section of the mat. A big (overdrive) button near the nose that you slam with the side of your fist or the heel of your palm. Ditto for the other types of air lubricated boards...they need some sort of switch. Be kind of fun to get in trim, wait for the wave to start tubing, then slam down the overdrive button. What effect would the loss of air have? Would it be better because its more flexible or reduced bouyancy ? How about a dual chamber mat but have a top chamber that stays inflated and a lower one that deflates ? Has anyone made a solid mat ? Like fibreglass over an inflated mat to see if its the flexibility or the shape thats so efficient. There's a local biotech company developing something they call "synthetic muscle." The stuff is like maple syrup when it's relaxed, but hardens up when a small electrical charge is applied. They supposedly modeled it after the fiber pattern found in abalone muscle. I think their aim is to make a bunch of money in the erectile dysfuntion market. I was thinking it would be cool to have a pair of swim fins made with that synthetic muscle in the blade. Variable stiffness swim fins. Maybe control it with a timered proximity switch. The fins are rigid when moving left and right past each other, but they go limp two or three seconds after you keep your feet together, like in a dolphin kick. I've often wondered how much drag you get when you have really stiff swim fins plowing through the wave behind you. I'm still working on the name, but I've narrowed my choices to "Erecta Fins" or "Stiffies." Yawn...getting late here. Only about an hour and a half left of April Fools Day. I better hit the submit button now. Heres a new design Im working on.... part board / part inflatable. Its got an EPS perimeter, then Im doing carbon rail wrap and an inflatable material skin top and bottom. The rails started out 5 inches wide now theyre down to 3. Im trying to get it as minimalist as I can, just a light semi rigid carbon perimeter and the inflatable fabric. Theres still about 50 % more foam to remove to get it down to bare bones functional. Its as close to riding on air as I can imagine, the inflatable component will give it that mega bouyancy and run, and the rigid rails will give it the paipo edge and trim. Its still a board but its just the exo skeleton. I have absolutely no idea, but looking at you shaping, a slightly different idea occurred to me. What would happen if you had a piece of ply sandwiched between the oval two pieces of foam so it wasn't directly in contact with the water. Your weight might put it in contact but the foam might reduce the amount of contact. The other consideration, a few paipo are based on the idea that the tail area provides the planing area and when you are riding, it is the primary surface in contact with the water. The nose serves little function. It might be worth also looking at footage of a spoon and seeing what part of the board is in contact with the water. Surfers Journal 20(4) has a piece with Carl Ekstrom. He describes a guy called Bufo who sells a stringerless, air-pressurized board. He's from Oceanside. Anyone know of this guy? I like that idea Bob, I always have a ton of new ideas but never the time to build them all ! I dont think theres enough foam in the new board for there to be adequate planing area on the bottom, when I was making hydrofoils I worked out that I can plane on a minimum area of 250 square inches, which is about the same area as 2 computer keyboards. Ive vac-bagged this perimeter rail with 2 layers of 10 oz Innegra instead of carbon fibre and sanded it smooth. well... maybe it does !!! Anyhoo, the next step is to measure and adhere the waterproof material to the glass, its a bit of a mental exercise to work out the best way to get the desired shape from the fabric once its inflated. Im going to use a pretty heavy weight of material for the first attempt as theres no fun in having it rip /split or tear on the first surf.... That'd just piss me off. The 2 part PVC glue is (allegedly) capable of making a solid bond with material and cured resin so we'll see what happens this week. XPS together with glass in between to slim it down but keep the strength. Strictly speaking its not a paipo or a mat but it is a prone surfcraft of some mutation. So I finished that board and Ive ridden it a few times, its got that uber-bubble feel from all the air but it also rides a bit like a solid craft. Its all control thru the front hand and the hips. Glued the PVC material on, no worries. Sits really high in the water and pretty much needs no extra inflation. Next one has a 1/2 in eps shell with glass and carbon lam and a twin pontoon design.